I'm so happy. It's on its way to Hannah today. I bet it will be Happy Hannah! I know I would. Quilt is beautiful! it's gorgeous - you did a fantastic job. And I love your label. You did such a beautiful job!!! The back is really, really cool. I love the polka dots and the stripes. How lovely is that! Go Sooners! At least I think it's Oklahoma University and not Oklahoma State University ;) Heh... I love your label too. I saw this college cheerleading competition once on ESPN. I got a big kick out of listening to the Alabama Crimson Tide cheerleaders. Go 'Bama, Go Tide... Such cute southern accents ;) My husband and I love to hear all the different accents across the U.S. when we visit different states. We have to watch ourselves, because we mimic, not in a bad way, the accent when we hear it. I love love love red and white. It is so so pretty. That's beautiful and Hannah will love her gift. It is so beautiful. I'm sure she'll love it! The label looks really good, you having found a very pretty labeling style! Beautiful, beautiful, beautiful! the label is even beautiful! Wow, it's so great! I love the label too! Hannah will be so happy with this gorgeous quilt!! 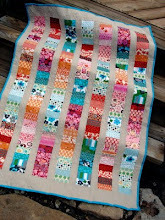 Just beautiful - love the scrappy binding!! This turned out amazing! 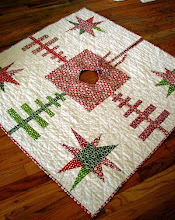 Love the red, and I'm really inspired to do a red and white quilt now. Guess it will have to go on my list. 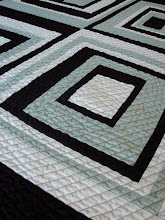 I love the quilting you did with this one. What a terrific feeling it is to be able to mark another one of the list. Gorgeous quilt and I'm sure Hannah will be thrilled. Love the red and white. It's a wonderful quilt. Lucky Hannah. very very VERY nice. I love it all. Wow Jaquie! 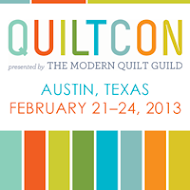 I love it all, the quilting, colors,label, every last inch of it! Everything about this is wonderful! looks great - love the binding. it's so beauitful!! i love red!! I wish my name was hannah! Wonderful quilt and I love the label. Thanks for your advice too - I look forward to trying my hand(s) at actually quilting it! A very nice quilt. Love the two color and varity of fabric patterns. 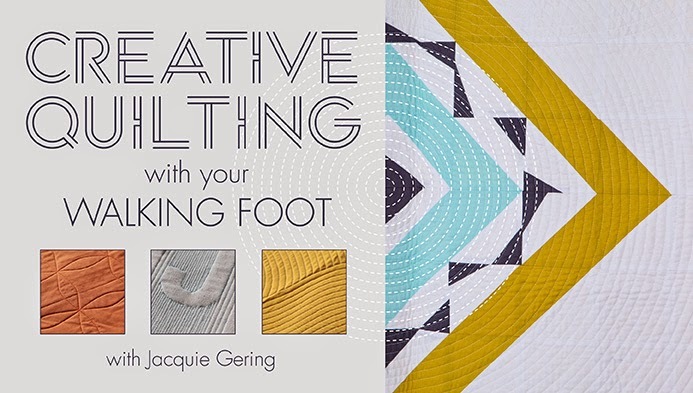 Fabulous work Jacquie! It turned out beautifully - Hannah will be delighted with it. What a cheerful quilt! She's gonna love it. So, did you manage to get your machine fixed or do you have the Bernina back again? so pretty! 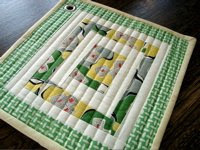 your quilts are always so fresh and clean. I love your work! It turned out very nice. I love it that you put some patchwork around the tag. This quilt is also in my "some day I will make" list. 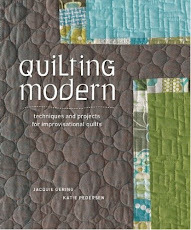 Oh, Jacquie, between your stunning quilts, our shared love of mid century modern and broadway musicals, and your "Just had to say..." post, I have to admit: I have a blog-crush on you!! This is gorgeous! I love the simplicity of it. Also,I left an award for you over on my blog. 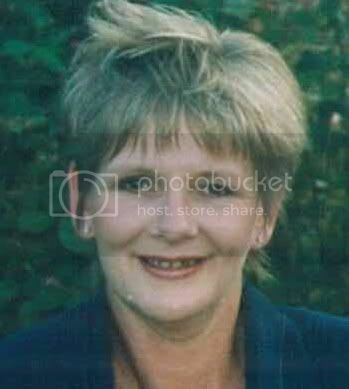 Oh Jacquie! It's absolutely beautiful. I love it. Love love love it. I hope you are proud of it. It is stunning! I know that she is going to love it. That is such a great gift for one who is going off to college for the first time. Her bed will be the envy of all around. FABULOUS! Love the framed label, love it all - well done! Oh I love it I love it I LOVE IT!!! I know she will love it. The pieced binding was the perfect finishing touch. Absolutely gorgeous...I love everything about it! Great label!! I just run out of words to express my feeling about this quilt. now, would you look at that!!! fantastic!! you did a great job!! 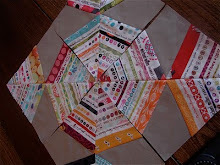 and I love the pieced back and binding!!!!! Perfect! Love the red dots on the back. Great idea and very pretty! Absolutely beautiful! Your quilt for Hannah is stunning. Love, love, love it! gorgeous! She will love it. Great job photographing it, too. Quilts are always so hard. Where have I been??? Tangled up in some dust rhino, I think. I am late to the game, but I think this is absolutely fantastic. You just amaze me..I think I've mentioned that at least once. 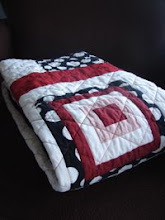 I've always loved red and white quilts! As you may have noticed I have a fondness fro red work. I have to tell you that this quilt is exceptionally good looking. I wish I was Hannah..... it is beautiful. They do. It is absolutely stunning. Just so beautiful...Needless to say RED is my favorite color. A great "Ta-Da!" moment. You gotta love checking off one WIP. A beautiful quilt. This is a fabulous blogsite!! I love the designs and fabric choices. May I use one of your photos on my blog? Thanks.